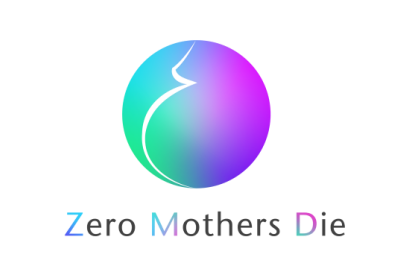 Zero Mothers Die Presented at Healthio Congress on Health Innovation! Zero Mothers Die (ZMD) was fortunate to be presented at the health innovation congress of Barcelona, Healthio, where the focus was on connecting patients and health systems with the latest innovations in healthcare. 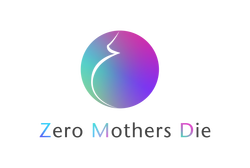 The Zero Mothers Die co-founders, Dr. Véronique Thouvenot and Dr. Jordi Serrano Pons, together with the Global Program Manager, Jeannine Lemaire, presented the ZMD project and the ZMD App at the three-day event, receiving much interest and positive feedback from attendees. We look forward to attending Healthio 2018! Zero Mothers Die is very happy to announce that we are partnering with the Gambo General Rural Hospital of Ethiopia on a project to localize the Zero Mothers Die App for the Oromia region of Ethiopia, which will involve the translation and adaptation of the content into Afaan Oromo by medical staff, specifically those involved in maternal, newborn and child health programs of the hospital. 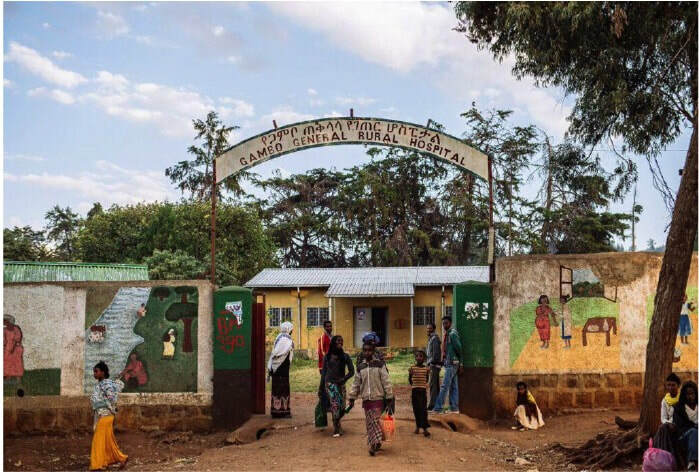 ​The Gambo Hospital is a District Hospital participating in all National Programs and World Health Organization Programs including Integrated Management and Neonatal and Childhood Illness (IMNCI), Integrated Management of Pregnancy and Antenatal Care (IMPAC), EPI (Expanded Program of Immunization), Therapeutic Feeding Centre for Severe Acute Malnutrition (TFC for SAM), Tuberculosis and Leprosy control, HIV prevention and diagnosis (being one of the permanent Sentinel Surveillance points for the national surveillance system), ART (Antiretroviral Therapy) and PMTCT (Prevention of Mother To Child transmission) services. 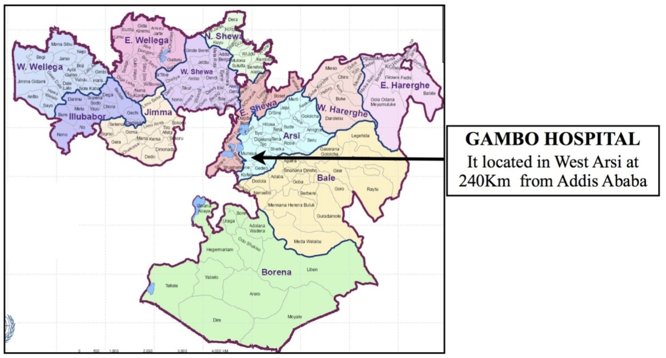 Gambo Hospital has a catchment area of 458,112 people. The content localization process is underway and we look forward to launching the ZMD Ethiopia App in 2018. If you are an organization interested in deploying a tailored version of the ZMD App for your country or region, send us a message! Our Zero Mothers Die co-Founder, Coumba Touré, was very fortunate to meet with Sri Mata Amritanandamayi Devi, known around the world as “Amma, the Mother of All.” As a spiritual leader, humanitarian and visionary, Amma has served the world-community for decades, imparting wisdom, strength and inspiration. Truly a citizen of the world, Mata Amritanandamayi holds free public programs throughout India, Europe, the United States and Australia, as well Japan, Sri Lanka, Singapore, Malaysia, Canada, Africa and South America. In her talks, she offers words of wisdom and guidance on both personal fulfillment as well as the most pressing matters of our time. From climate change to terrorism, crosscultural tensions to poverty and women's rights, Amma's observations invite each of us to get involved in the process of rebuilding a concerned and caring society. To this day, Mata Amritanandamayi concludes her programs by embracing each person attending the event. Far from a brief book-signing or walk along the rope line, these personal, one-on-one meetings take up the vast majority of Amma's time. Amma has given this motherly embrace, known as her darshan, to more than 33 million people throughout the world. She has been known to give darshan for more than 22 hours without interruption. The most personally accessible spiritual leader alive today, Mata Amritanandamayi may well be on a first-name basis with more people than anyone else in the world. When people pour out their hearts to Amma, she offers them emotional solace, spiritual guidance, and concrete solutions to their problems. Receiving Amma's embrace, many feel inspired to offer selfless service to those in need. In this way, this simple yet powerful act as a mother's embrace - has become both catalyst and symbol for the growing international network of humanitarian initiatives that is Embracing the World. 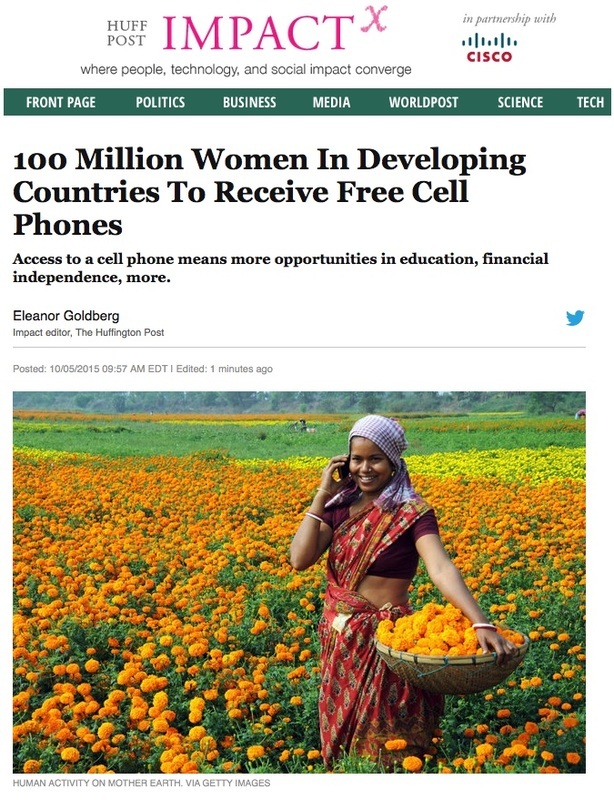 Eleanor Goldberg has written an exciting article as Impact Editor for The Huffington Post about a new commitment from two major companies to provide 100 million women with mobile technology over the next five years! Tata Communications and MasterCard announced their plan to join up in order to bring the technology to women in need at this year’s Clinton Global Initiative. They’re launching the program in India, Nigeria, Indonesia and Guatemala, with the goal of initially targeting 25,000 women [part of a larger vision to ultimately reach 100 million women]. Best of all, Eleanor Goldberg highlights Zero Mothers Die as one of the like-minded organizations that believes in the potential of mobile phones for empowering women, which has led to our development of a mobile health initiative to deploy technology solutions directly to pregnant women in developing countries to help them gain access to critical healthy pregnancy and childbirth information. ​Pregnant women and new mothers who live in rural areas often face greater health risks because they lack access to medical clinics. 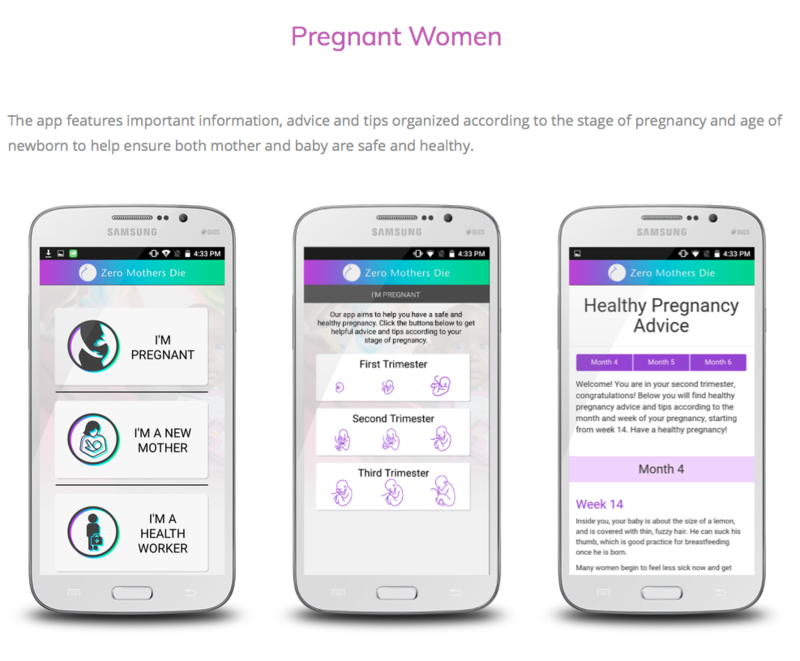 To ensure that pregnant women and new moms are armed with the information they need to protect themselves and their babies, a number of groups have developed mobile platforms that can reach women everywhere and save as many as 800 women a day who die from preventable conditions, Reuters reported in 2013. 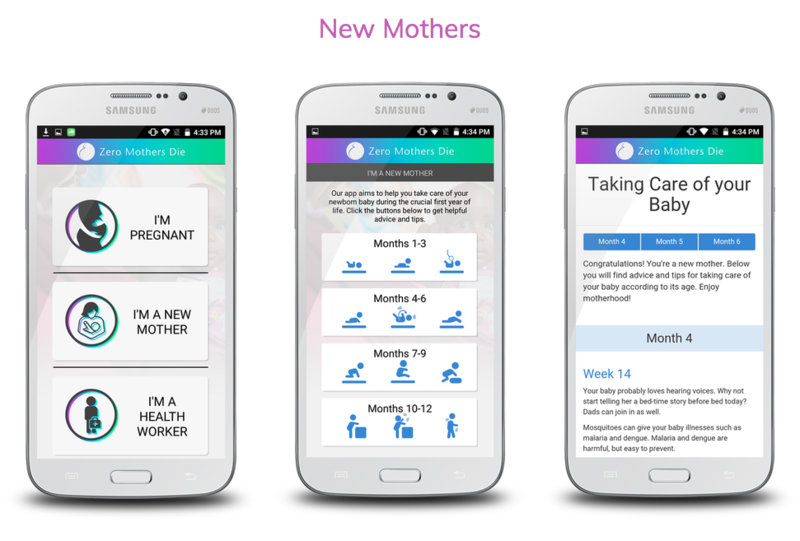 One such group is Zero Mothers Die, a mobile program that provides critical maternal, newborn and child health information. We highly recommend reading the full article directly on Huffington Post Impact and let us know in the comments what you think about the potential of this initiative! Fashion 4 Development (F4D) is an international private sector platform that supports the United Nations Millennium Development Goals (MDGs) and "Every Woman, Every Child", a UN Initiative spearheaded by the Secretary General Ban Ki-Moon. Its mission is to harness the power of the fashion and beauty industries and implement creative strategies for sustainable economic growth, wellness and independence of communities worldwide and the preservation of culture through the expression of fashion. 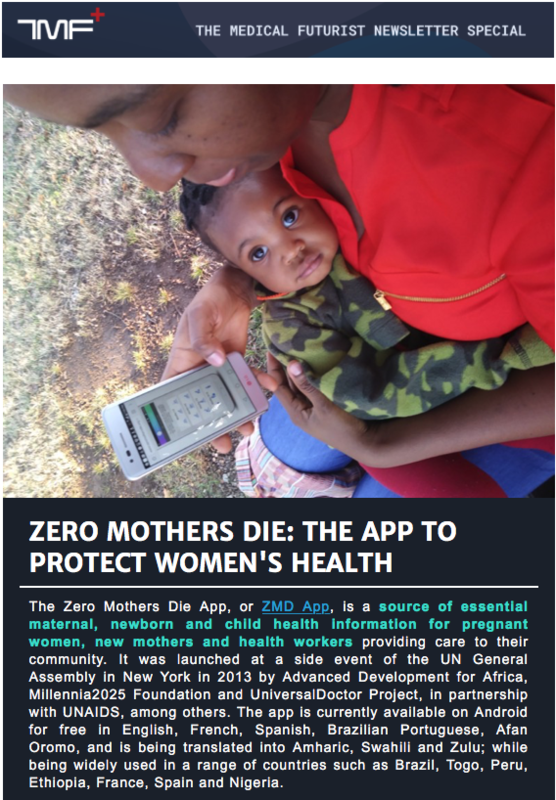 Zero Mothers Die is featured on F4D's website and F4D TV channel (above) as a key global initiative to tackle maternal and child mortality using technology! 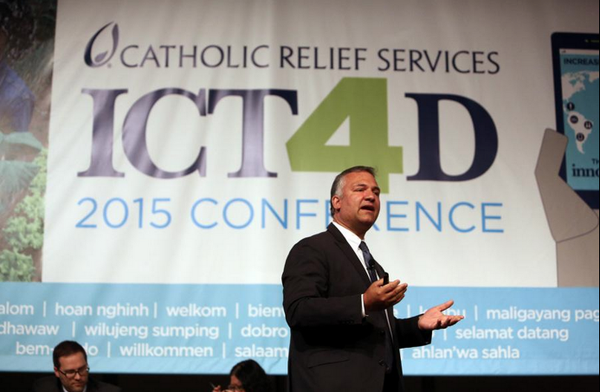 “Increasing impact through innovation” was the central topic of the 7th annual ICT4D Conference that the non-profit organization Catholic Relief Services (CRS) held in Chicago, IL, from the 27th to the 29th of May, 2015. Representatives from government, academia, the telecom, software and banking industries, and development and non-profit organizations got together to share lessons and promote initiatives that use information and communication technologies to improve agricultural and emergency response practices, build capacity, and increase access to healthcare and financial services among disadvantaged populations around the world. Despite the diversity of topics covered over more than 100 sessions, the unifying thread of “impact and results” brought about recurrent discussions among the participants on best practices to implement monitoring, evaluation, accountability and learning (MEAL) procedures in ICT4D programs, and other factors necessary to implement sustainable solutions built for scale. The conference underscored the key role that public-private partnerships and local champions play in achieving these goals, as well as ways in which integrating innovation on M&E, remote sensing, data management and data visualization software can improve decision making. In the area of e/mHealth, a conference highlight was the keynote presentation of Dr. Alain Labrique, Director of the Johns Hopkins University Global mHealth Initiative. Dr. Labrique explored the value of mobile connectivity for the continuity of care, stressing the ability of these technologies to compress time, connect people and create windows of opportunity, providing new ways to tackle persistent healthcare problems. 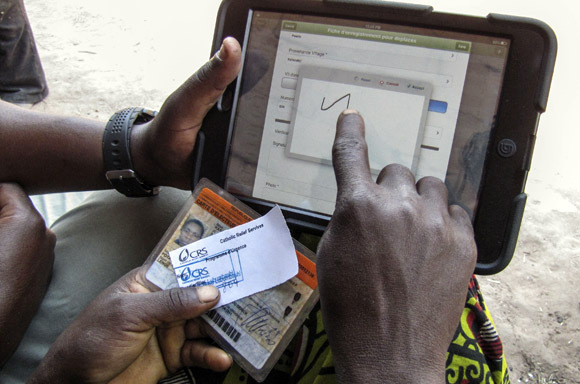 He defined mHealth as a “health systems catalyst” that helps bring effective interventions to scale, increasing their coverage and overall impact. If we overcome the urge to “reinvent the wheel”, he noted, mHealth solutions that target patients, providers and the healthcare system can fill identified gaps and help “optimize what we know works”. Dr. Labrique pointed out that successful mHealth projects for maternal health are being integrated into national programs, as is the case of MAMA in South Africa. 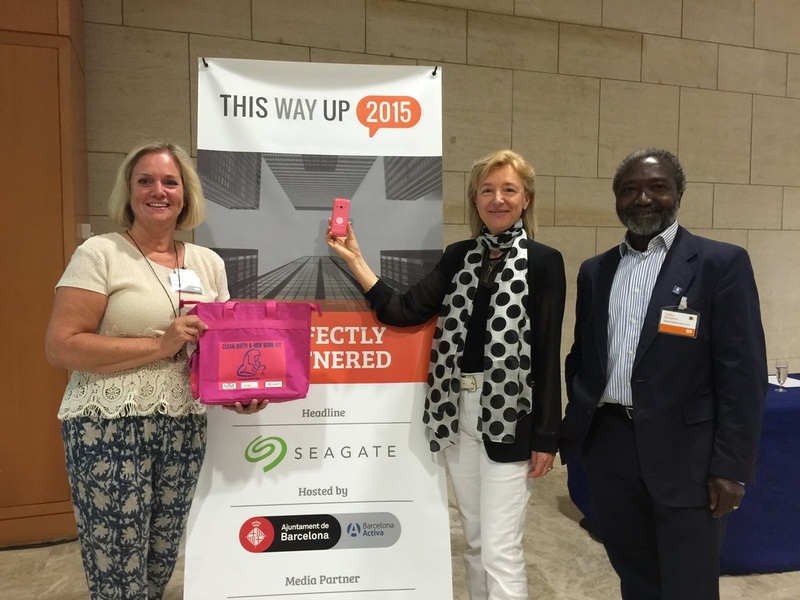 The conference also included presentations on MomConnect, the national pregnancy registry system in South Africa, which uses cellphone SMS technology; D-Tree’s Safer Deliveries mHealth referral and emergency care project in Zanzibar that seeks to increase maternal use of healthcare facilities; and a pilot project implemented by RCRA in Uganda that combines the use of mobile phone applications with radio and TV messages to register, monitor, refer and educate women throughout their pregnancy and even after labor. Securing funds, however, remains an issue for the sustainability of some of these initiatives. As Senior Advisor in ICT Applications for the WeObservatory, I had the pleasure of representing the Millennia2025 Foundation and Zero Mothers Die in the Fostering Innovation track of the conference, sharing information on the Intelligence MOOCs Commons for Women and eHealth (WeMOOCs), a WeObservatory’s initiative to support capacity building in the areas of women, health and technology. The WeMOOCs presentation generated interest on the compilation of massive open online courses in English, French and Spanish, currently offered in these three areas. We also brought attention to the current lack of MOOCs addressing the use of ICT for women’s and maternal health, calling upon interested parties to collaborate on the development of MOOCs on diverse perspectives of this topic.